Miller Hall is available to rent for parties, receptions, and other events. The Hall is typically available on Friday and Saturday Nights from 8:00 pm until 2:00 am. However, other days and times are probably available – please inquire with the office after checking the St. George’s Parish Calendar. The church provides tables and chairs for as many as 125 guests as well as access to a commercial grade kitchen for use during events. Seating capacity for Miller Hall is 100 people. 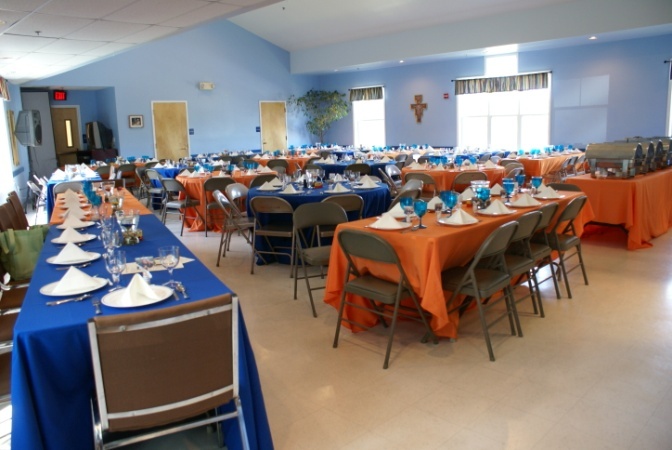 St. George’s provides one hundred chairs, six round tables seating eight persons per table and six long tables seating eight to ten persons each. Hall capacity is not to exceed 125 people. St. George’s requires a Security Deposit in the amount of $300.00 if no beer and wine are served at the event. 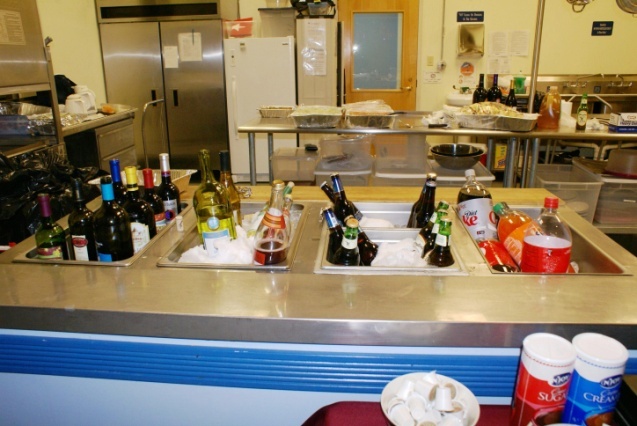 If the Party intends to serve beer and wine, the Security Deposit is $400.00. The Security Deposit may be refunded to the Party following the event provided it has been determined by St. George’s that there is no damage to the premises and that all Building Use Guidelines have been followed. This includes a satisfactory cleaning of the Hall and the outside grounds. A Security Officer representing St. George’s will be on site during the entire event. The Security Officer is present for troubleshooting and to make sure your event goes smoothly. 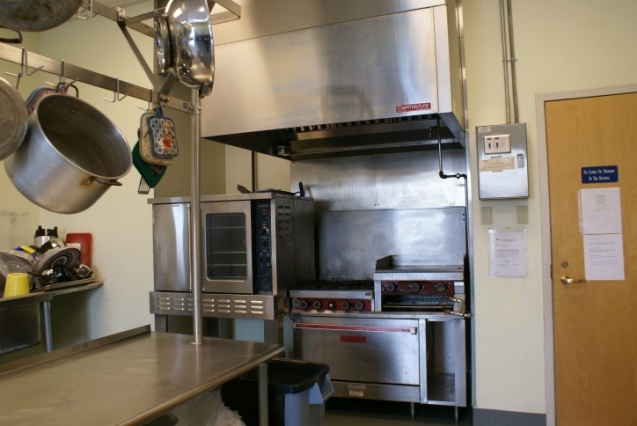 The Miller Hall Rental Donation Fee is $750.00 ($125.00 per hour). This fee covers the six hour rental period from 8:00 PM to 2:00 AM. If you are interested in using Miller Hall you must come to the Parish Office to complete and sign a contract. By executing this written lease agreement, you are acknowledging and consenting to abide by the Building Use Guidelines. Additionally, the Security Deposit must be paid in order to hold your reservation. Fifty percent of the Hall Rental Donation Fee is due to St. George’s within fourteen days of reserving the Hall and the remaining balance is due one week prior to the date of the event. Cancellations are permitted up to 30 days prior to the date of the event. Any cancellations within 30 days of the event will result in forfeiture of the Hall Rental Donation Fee and the Security Deposit. The Security Deposit is non-refundable regardless of the date of cancellation. If you have any additional questions or if you would like to see the Hall, please contact our Office Assistant, at (301) 262-3285 or email: office@stgeo.comcastbiz.net. St. George’s Episcopal Church is located at 7010 Glenn Dale Road in Glenn Dale, Maryland. It sits across the street from the Glenn Dale Post Office. The Parish Office is open from 9:00 am – 3:00 pm Tuesday through Thursday. Please call ahead to make certain someone is in the office to assist you.